History abounds in Ceres and many sites are worthy of special attention. 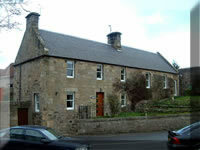 These include Craighall with its beautiful den, Struthers Castle, the Parish Church with its ancient graveyard and mausoleum, Scotstarvit Tower, Hill of Tarvit Mansion House and of course, the Fife Folk Museum, which occupies the old weigh house and several weavers' cottages in the oldest part of the village. The Ceres of the mid 19th century was a far busier place than it is today. The chief source of employment in those days was the linen Industry with almost every cottage housing a loom, and with three spinning mills at work within the parish. There was a bleachfield at each end of the village, one at St Ann's at the foot of Craighall Den and another at Newtown. The close proximity of the mills, bleachfields and weavers, led to a profitable arrangement all round, with the mills supplying the bleachfields and the bleachfields in turn supplying the weavers. In the 1850's the value of trading in this Industry alone was an estimated £50,000 sterling per annum. Farming was, as it still is, a major employer in the 1850's, and there were three conventional water driven meal mills and a windmill at work in the parish. According to an account of the time, there were thirty-seven threshing machines and one hundred and thirty ploughs in use. 3200 acres of land were turned over to the growing of crops with another 4000 acres in use for grazing. Such a busy community required a large range of services. These included five bootmakers, ten dressmakers, five tailors, eight joiners, nine grocers, a saddler, a wheelwright, a cooper, three blacksmiths, a sub post office, two china merchants and no less than twenty-five Inns. A daily coach passed through the village during the summer to meet the steamboat to Edinburgh. Nowadays with only one school in the village, with a roll of around 120 pupils, it is hard to believe, that according to a record of 1845, there were three contribution schools and one secession school, besides schools at Baldinnie, Craigrothie, Pitscottie and Tarvit Mill. In addition to these, there were one or two small private schools and two girls schools. Situated opposite the craft shop is 'Kimberlay'. The property once housed the village boardroom, where one lady ran her school. There was another of these schools at Croftdyke, where the principle subject was needlecraft. Bridgend School was opened on Back Latch in 1855 with a Glasgow lady as head teacher. Penmanship in those days, was a fine art and classes in this subject were conducted in a house somewhere near the Castle. The present school was opened in 1836, built by the heritors and named Ceres Parochial Academy. It was described at the time as being, 'A very handsome building, far surpassing the common structure of schools, with its exterior elegantly finished and its interior in harmony with the outside appearance'. Ceres possessed three annual markets. The first one of the year was In March, the second and leading one in June, and the last one in October. The March Market was the first to decline. The 1860's saw it gradually disappear until around 1868 when it was finally abandoned, The October Market continued longer, with a considerable showing of livestock as well as the sweetie stands and various stalls that were a feature of all the markets. This too however began to show signs of 'falling off' during the 1870's. New methods of buying and selling livestock were coming into vogue as breeders began to find it more profitable to transport their herds by rail to the new marts that were springing up at the stations of the larger towns. The Ceres October Market struggled on into the early eighties until it too had disappeared. June Market with its Plack and Penny Day was the proudest event of the Ceresian year. Traditionally held to commemorate the part played by the men of Ceres at Bannockburn in 1314, the market was held on the 24th and 25th of June each year and included, on the second day, the famous Ceres Derby. The tradition of the June Market still continues today in the shape of the Ceres Free Games, held on the last Saturday of June. Although the livestock trading is long gone, the dancing and competitions continue. The Ceres of the early 1900's had changed considerably as a result of the industrialisation of the linen manufacturing process, and the only remnant of this once major village occupation was the bleachfield at St Ann's which still employed several workers. For the majority however it meant a trek over the muir to Cupar or a train to Dundee to find work. Agriculture was by now the main source of employment within the parish. Today Ceres has one supermarket incorporating a sub post office, a butcher, a newsagent, three antique shops, a garage, a coffee shop, a book shop and two public houses. Most villagers now travel outwith the parish to work. A far cry from the mainly self sufficient community of some 150 years ago. 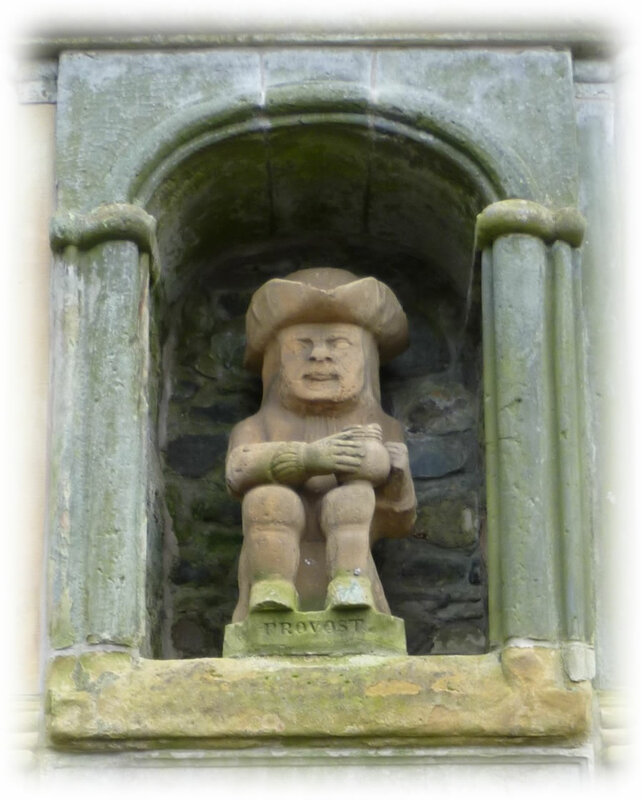 The village was described by John Scott Moncrieff the historian, as "the most attractive village in Scotland". 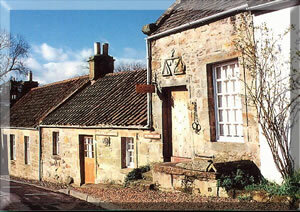 With its old cottages, village green, ancient hump backed bridge and the Fife Folk Museum, Ceres justifies such acclaim. Click on the Provost below to download a walking tour of our village of Ceres.